Greetings BigFix’ers in the midwest. We are planning the next BigFix User Group meeting for the greater Ohio Valley area on Thursday, July 19th at the Kroger Technology Landings facility in Blue Ash, Ohio. Advance registration is required for access into the Kroger facility where we’ll be holding the users group meeting. To register, please visit our Eventbrite listing and provide the necessary contact details. Want to know more or ask a question to organizers regarding this event? Simply post your question to this forum post or to our LinkedIn group. Thank you in advance to those that will be attending and speaking. Many thanks to @masonje for booking the facility and to Kroger for providing the venue for our upcoming event! Many thanks to the BigFix teams at CBI, HCL and IBM for their support of our BUG. IMPORTANT — This is a free, in-person user group event and attendees must cover their own travel and related expenses. If you cannot attend in person, please do not register for this event. I am interested in any one of the following dates! Thanks Casey for taking the initiative! I would be interested for Thursday, June 28th. July is better than June for this guy. Wait… wha!?! How did I get pulled into this @cmcannady? Actually it will be a blast. Sorry buddy… I’m going to need help to pull this off and I’m dragging you down with me. Looking forward to getting this on the books and seeing everyone. Thanks @masonje for putting up with me. Actually after further examination of a calendar, I am open June 28th or July 12th. July 12th works best for me, but could probably make any of them work. Will be moving July 1st, so the June date will be hectic. Let me know if you need some help with any of the efforts. I will ask as soon as I get to HCL…not able to commit to anything right now though for any of the dates…maybe the next one if I cannot do this one. Afternoon all. We’ve had some great feedback and hope to have the date locked soon. I’m working with @masonje on getting the venue scheduled by end of this week. This should allow those planning to attend to mark their calendars and make travel and other arrangements. More details to follow later this week. I am looking forward to attending the user group meeting. All the dates you listed are good for me. The July dates work better than June for me. How about July 19th? I’m having trouble finding a room. @jgo and others, how is the July 19th? I booked the room on my side, but I can try to move it. 6/28 and 7/12 is booked for all the Kroger rooms. I am booked on July 16th-18th. I will fly in late the night before. It will work. Good evening all. 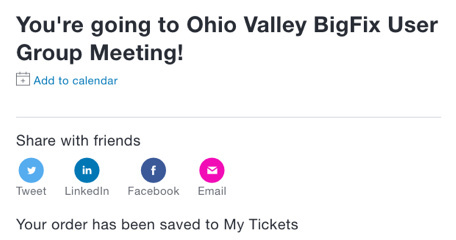 The date for the next Ohio Valley BigFix User Group is official… mark your calendars for Thursday, July 19th and register via Eventbrite. The original post above has been updated to reflect the current details. As the agenda is finalized, it will be updated here and on Eventbrite. If you’re planning to attend and have a topic you’d like to present, please contact @cmcannady or @masonje. We would like to have a good mix of BigFix customers and IBM/HCL experts present, so please don’t be shy. Attention BigFix customers… if you’re planing to attend our BUG in July and have a topic that you’d like to present, please reach out to me directly. Thank you.